Patients are benefitting from quicker more detailed scans which are helping to speed-up diagnosis thanks to the opening of a new state-of-the-art gamma camera suite at City Hospital. Sandwell and West Birmingham Hospitals NHS Trust (SWBH) has invested £1.4 million in the new suite which was officially opened today by Sandwell and West Birmingham Clinical Commissioning Group Chair Dr Nick Harding. The two new cameras act as a ‘one-stop shop’ meaning separate investigations that could take up to 2-3 weeks to perform, can now be done in less than an hour. Dr Bill Thomson, Head of the Physics and Nuclear Medicine Department, said: “We do full-body scans of patients who may have breast or prostate cancer and there is a possibility it may have spread to the bone. “In the past if we were concerned about any ‘hot spots’ the patient would have had to come back for a CT scan but now they don’t have to as this can be done at the same time, building up a 3D image, so we can see immediately which part of the bone is abnormal. The department also carries out 2,000 scans of cardiac patients a year – it used to take 35 minutes to process one cardiac study and now it takes less than 5 minutes using updated image processors. The cameras also give more diagnostic information by measuring the calcium in coronary arteries. This provides more detailed information to the consultants allowing them to decide whether an operation to clear a blocked artery is necessary at that time or needs further monitoring. The extra information provided by the cameras are also helping to provide a clearer guide for surgeons operating on patients with endocrine problems. The gamma camera suite, which also included the building a new waiting room and reception area, was opened by Dr Harding, who was joined by his father Dr Keith Harding, who founded the Nuclear Medicine Department at City Hospital 40 years ago. 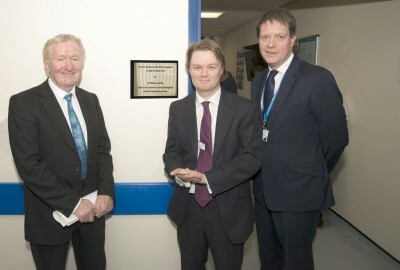 Dr Nick Harding, who also worked at the department while he was a medical student and remembered coming into the department as a boy with his father, unveiled a plaque before taking a tour of the suite with SWBH Chief Executive Toby Lewis. 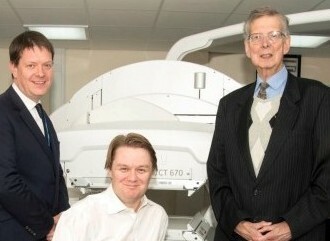 Dr Harding said: “It’s fantastic to see such innovation improving the experience of patients in our area.